STEPHANIE GERVAIS is an artist living and working internationally. Her individual works and installations incorporate photography, sculpture, language, and sound to focus on social crises and spaces of cultural hybridity. Living and working outside of the US for nearly a decade in Brazil, the UK, and France, Gervais’ most recent body of work was made within and in relation to refugee camps and communities in Calais, France. The work is a conceptual portrait focused on the daily life of the camp as a transitional border space. Gervais records the stories and experiences of residents, translating individual and collective experiences into objects such as textiles, embroideries, typewritten documents, and intricate large-scale sculptures. Gervais has shown her work in France, the UK, Brazil, and the US. She regularly collaborates with individuals, communities and institutions. Her most recent solo exhibition, Gulalhi, was on display at The Douglas F. Cooley Memorial Art Gallery at Reed College (Portland, OR) from November - December 2018. She was also recently a teaching Artist-in- Residence at the Oregon College of Art and Craft. 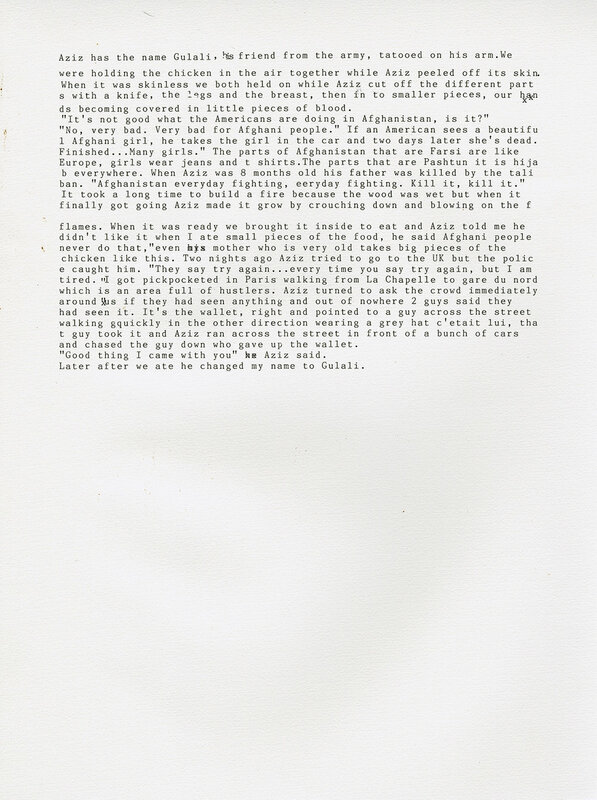 Gulalhi, 2018 Typewritten page, 12.5 x 9.4 in.